NEW YORK (Reuters) – David Einhorn’s hedge fund has shown a “likelihood of success” if his legal attack against Apple Inc goes forward, a U.S. judge said, though he made no immediate ruling on fund’s request to block a shareholder vote on a proxy proposal next week.U.S. District Judge Richard Sullivan on Tuesday reserved decision on a lawsuit by the fund, Greenlight Capital, to stop a February 27 shareholder vote on an Apple proposal to end the issuance of preferred stock without investor approval. “Candidly I do think the likelihood of success is in favour for Greenlight,” Sullivan said at a court hearing in New York. The hedge fund sued Apple earlier this month as part of Einhorn’s broader attempt to get the company to send a bigger chunk of its $137 billion in cash to shareholders. The lawsuit contends Apple improperly “bundled” three proposed amendments to its charter into one proxy proposal, a violation of regulatory rules. Sullivan did not specify when he would rule on Greenlight’s injunction request, though he cited the impending date of the vote. He said he would now focus on whether Greenlight would be irreparably harmed if the vote moves forward. Steve Dowling, a spokesman for Apple, declined comment. A spokesman for Einhorn did not immediately respond to a request for comment. The proxy proposal Einhorn has targeted, Proposal No. 2, would amend Apple’s charter to provide for majority voting for directors, establish a par value for Apple stock and eliminate Apple’s power to issue preferred shares without shareholder approval. Mitchell Hurley, a lawyer for Greenlight, said Apple had violated U.S. Securities and Exchange rules that prohibit shareholders from voting for a proposal where they support only some but not all of the item. Einhorn says he supports two of those amendments but not the preferred stock amendment. “In other words, it will result in precisely the kind of harm the rules were designed to prevent,” Hurley said. Apple contends Proposal No. 2 doesn’t bundle material matters together or force shareholders into an unfair choice. “The SEC had no objection and no comment” on the proposal, said George Riley, a lawyer for Apple. While Sullivan said Greenlight may have shown it would likely succeed on the merits of the case, the judge during the hearing questioned whether an injunction was appropriate. The proposal became public in late December, yet Einhorn didn’t sue Apple until February 7. “I’m not sure that necessarily is going to get you over the hump for irreparable harm,” Sullivan said. A separate lawsuit against Apple heard at Tuesday’s hearing was filed by a different investor, Brian Gralnick. The lawsuit seeks to block not just a vote on Proposal No. 2 but also an advisory “say-on-pay” vote on executives compensation. Sullivan indicated Tuesday he would rule against Gralnick on his request for an injunction. 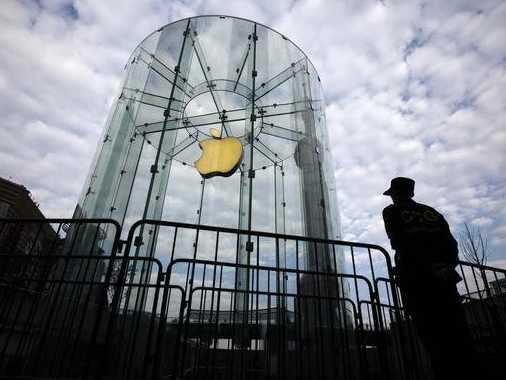 Apple shares ended regular trading on Tuesday down 17 cents at $459.99.